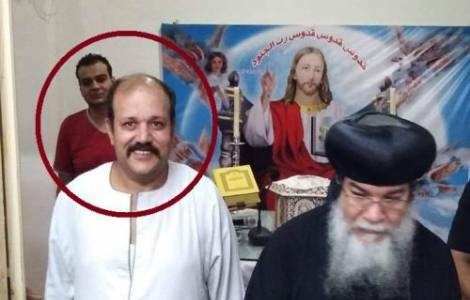 Minya (Agenzia Fides) – A security guard at a church in the Egyptian city of Minya used his service weapon to kill Copt Christians Imad Kamal Sadiq, aged 49, and the latter’s 21 year old son David. The double murder happened in the evening of Wednesday 12 December, in front of the Nahdet al Qadasah church. According to information supplied by the police– and circulated by the media – already on the Tuesday the previous day there had been an argument between the security guard and the two Copts who were working on a building site in front of the church. The argument re-exploded the next day with tragic circumstances: at the end of the argument the security guard drew his service weapon and fired at Imad and his son David. Their rapid transport to Minya general hospital was in vain. The guard was arrested by the security forces. Today 13 December the funerals of the two men were celebrated by Copt Bishop Anba Makarios Minya (in the photo with the two Copts killed). (GV) (Agenzia Fides 13/127/2018).